The Zanzibar suni a subspecies of the suni, an antelope species found on the island of Zanzibar in Africa. 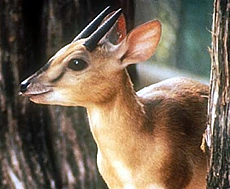 It is a very small antelope and is also sometimes called the dwarf antelope. Adults only reach between 13 and 15 inches high at the shoulder and weigh only 10 to 12 lbs. They are reddish brown in color with a darker back, sides and legs. The belly and chin are white, and there are black rings that appear around the eyes and the hooves. 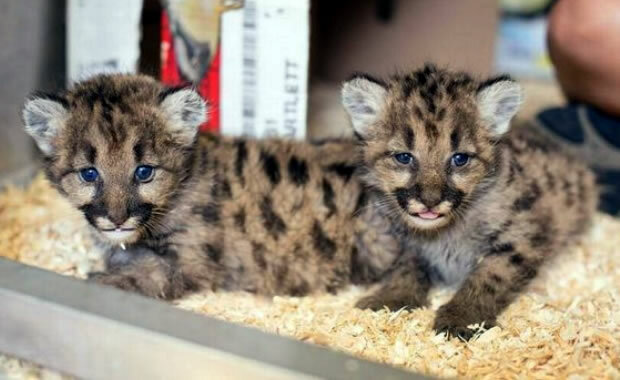 They also have white spots on their coats which provide camouflage against predators. Males have horns that grow between three and five inches long. Females do not have horns. Suni prefer thick, dry underbrush for their habitat either in montane forests above 9000 feet or in riparian reed scrub. They are very shy and secretive and are active only in the evenings or at night. Much of the day is spent sleeping in sheltered and shaded areas, and they are known to freeze in order to blend in with their surroundings when attempting to avoid detection by predators. Diet consists of leaves, fungi, fruits, and flowers. Although suni prefer to live near a water source, they can survive long periods of time without water. Males are territorial and mark their space with dung piles and secretions from their preorbital glands. They usually allow one mate and other females to share their territory. Females give birth to one calf after a gestation period of six months. This species is threatened mainly by habitat destruction and excessive hunting by humans. To preserve the species, conservationists are working to manage its remaining habitat, and the suni hunting season is limited to only six months per year. Glenn, C. R. 2006. "Earth's Endangered Creatures - Zanzibar Suni Facts" (Online). Accessed 4/23/2019 at http://earthsendangered.com/profile.asp?sp=437&ID=1. Need more Zanzibar Suni facts?